LONDON, Feb. 7, 2019 – Imagine watching a season-defining moment, then reliving it from any angle including from the perspective of your favourite player as they run up to take a penalty or make an improbable goal-line clearance. In partnership with Arsenal FC*, Liverpool FC* and Manchester City*, Intel will deliver immersive experiences via Intel® True View at Emirates Stadium, Anfield and the Etihad Stadium. Now their fans worldwide can enjoy the biggest moments of the match from every angle, whether they’re watching the Rights Holders’ live broadcast and highlights or reliving the action post-match from their favourite clubs’ official website, mobile app or social media. As three of the most recognisable and innovative football clubs in the world, Arsenal FC, Liverpool FC and Premier League* champions Manchester City will leverage Intel True View to capture every match element from every angle. 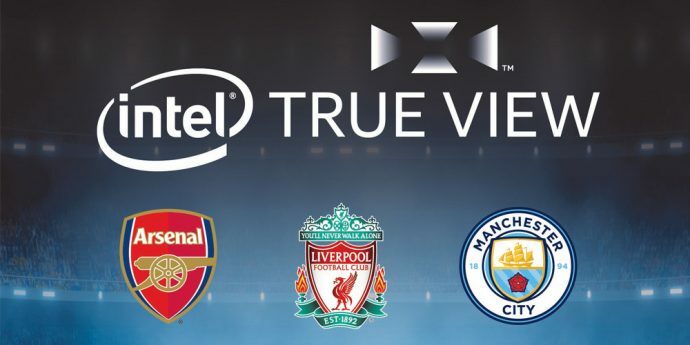 Intel True View re-creates the action on the pitch and presents that from an ideal vantage point or player’s perspective, using Intel’s unmatched data-processing capability to deliver the experience to fans. Beginning March 10, Intel’s leading volumetric technology will bring fans as close to the action on the pitch as the starting XI from the world’s most iconic football clubs. With dedicated supporters across the globe, football fans are passionate about the tactics as much as the goals scored, and Intel True View will highlight the immersive experiences unique to the style and skill of football. Multi-angle views of a play: Intel Sports’ industry-leading volumetric video process creates thrilling 360-degree replays and highlight reels from every conceivable angle, using 38 5K ultra-high-definition cameras. Laser wall: A virtual plane giving viewers a clear picture as to where players are positioned on the pitch. 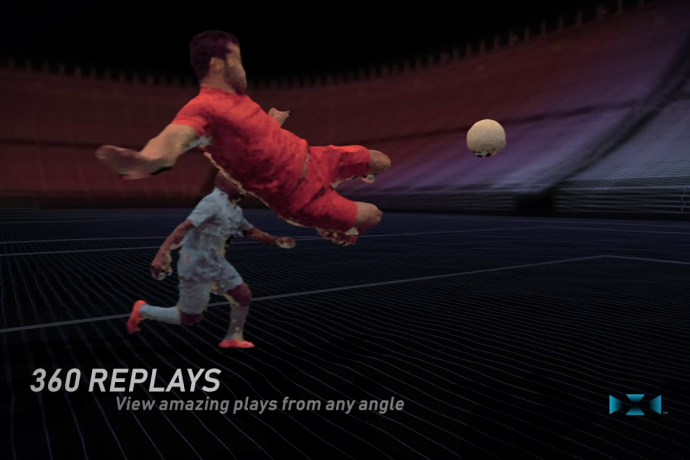 Be the player capabilities: Intel True View freezes a moment in the match to let fans see the pitch from the eyes of a player. This also enables presenters and pundits to share a new level of insight into the tactics and decisions made by players to provide an entirely new perspective to fans. Intersection of Sports and Technology: The sports industry is undergoing a period of significant change as consumer behavior is shifting, driving technology, leagues and brands to address the expectations of fans. In 2018, technology investments into sports reached nearly $1 billion, continuing to drive the intersection of sports and technology. With smart and connected tools, Intel is uniquely positioned to enable the sports industry to capture, analyse and respond to new levels of insight in real time and create amazing new experiences for fans. How Intel True View Works: The process begins with volumetric video, the capture and rendering technique behind Intel True View. Using the volumetric capture method, footage is recorded from 38 5K ultra-high-definition cameras that includes height, width and depth of data to produce voxels (pixels with volume). After content is captured, a substantial amount of data is processed with servers powered by Intel® Core™ i7 and Intel® Xeon® processors. The software then re-creates all the viewpoints of a fully volumetric 3D person or object. That information renders a virtual environment in spectacular, multi-perspective 3D that enables users to experience a captured scene from any angle and perspective and can provide true 6 degrees of freedom. Peter Silverstone, commercial director of Arsenal FC, said: “We are always looking to find new ways to bring our 780 million fans and followers around the world closer to the action and this partnership will give our fans a whole new view of the game. The technology effectively allows a supporter to step into the boots of players and see the game from their perspective. “We have seen the impact this Intel technology has had in other sports leagues across the world and are excited that it will be installed at Emirates Stadium. Billy Hogan, managing director and chief commercial officer of Liverpool FC, said: “We’re delighted to be working with Intel to bring this advanced Intel True View technology to our supporters. “Intel True View enables fans to immerse themselves even further into the game and has the power to add a new depth to match highlights, which can significantly improve the supporter experience. This technology has the potential to add a new dynamic to how people interact with the game and create different conversations with our fans around the world. 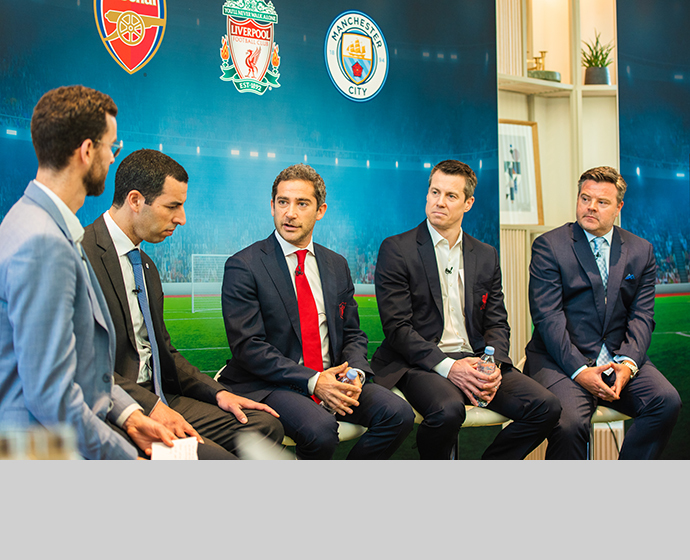 The post Arsenal FC, Liverpool FC and Manchester City Bring Immersive Experiences to Fans with Intel True View appeared first on Intel Newsroom.